When I was in high school, my college research consisted of reviewing a few books and magazines at the library (actual books), to identify potential colleges where I could enroll in a respectable architecture program and hopefully go abroad for a quarter. Today, college recruiting is full-tilt, including active solicitation of our sons (beginning in middle school), ongoing newsletters (weekly/monthly), and, of course, in-person campus tours. 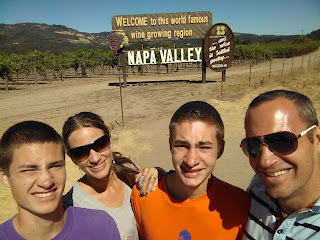 When Caleb’s soccer team qualified for a tournament in Northern California the second weekend of August 2012, we jumped on the idea to combine it with a college tour. The Bay Area boasts several well-regarded colleges, public and private, that welcomed our entire family for a visit. It was also a great opportunity for Caleb to “showcase” his soccer skills in at an invitational soccer tournament, where 60+ college recruiters were watching. Despite the distance, it was a great drive and time well spent. We departed Sunday afternoon, August 5th, after Anthony’s team finished the Starfire tournament in Tukwila. After a quick change in the car, we departed for California. We stopped in Centralia for a short shopping spree at the Nike Factory outlet, then eventually made our way to Portland for dinner (Mississippi Street – one of our favorite strolls). Unfortunately, the food carts we so love were closed for dinner, and we had to settle on a quick bite at “Little Big Burger” to satiate our appetites. The burgers were flavorful, but their truffle fries were most memorable. Thereafter, we made quick time to Center Point, Oregon to crash at the Holiday Inn Express for the night (arriving about midnight). Monday morning navigated the “labyrinth” of streets in Center Point to find Starbucks for a morning pick-me-up. Mid-summer weather made for easy travel over the Siskiyou’s. Mt. Shasta offered a warm welcome upon arriving in northern California (Janelle reminisced about a childhood report on Mt. Shasta and bringing the classic soda to school). We exited in Williams to explore a less-traveled, state highway to Napa valley for a late lunch. We passed an attractive fruit-stand (Janelle drooled), and I committed to stop on our return trip to Seattle. The California heat welcomed us and we relished the sunshine road-side, while Janelle took snapshots. We had to make a u-turn in Middletown (one of several on this journey), after passing a local antique store. Janelle scored and found some unique, antique Mason jars for canning (she reminded me they would be necessary for all the produce she was going to buy at the fruit stand 50 miles back, on our return trip!). 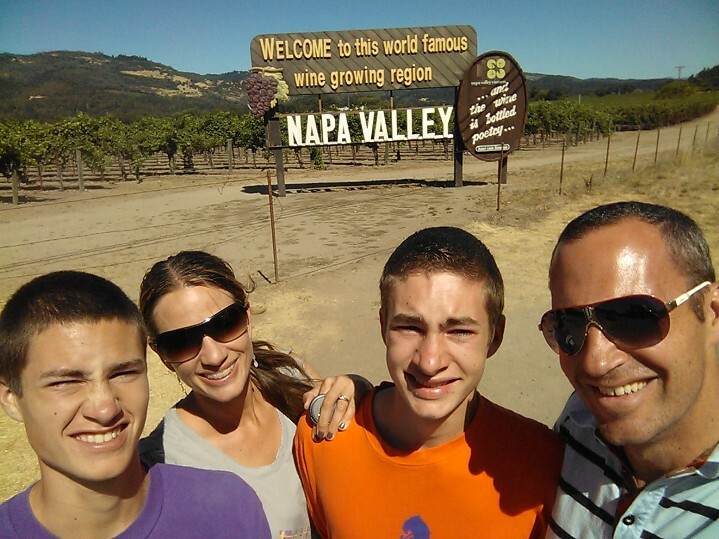 One more u-turn and we got a keepsake snapshot in front of the classic Napa valley sign (great idea Anthony! ), before finally arriving at Farmstead in St. Helena for a late lunch. Farmstead is a classic, farm-to-table restaurant boasting local ingredients and a well-regarded chef to share culinary inspirations with its patrons. We were not disappointed: Farmstead delivered on taste and ambiance. Caleb and Anthony enjoyed a burger creation (including an egg on top), while Janelle and I savored meatballs and organic greens. The cocktails were superb, but just too small (Janelle coined it a “three-sip” temptation, compelling you to buy more). Farmstead, note we prefer a more generous pour please. Afterwards, we sauntered down the Silverado trail to soak up the road less traveled and picturesque wineries hillside. Notwithstanding a stop to take pictures of grapes and decompress (a.k.a. a vigorous discussion outside the car and ears of our children), we pushed onward to the San Francisco Golden Gate Bridge. The Chevron refinery fire caused us concern as we rounded the north side of the bay (until the emergency broadcast system notified us it was not a terrorist attack). Once in the city, we drove back down memory lane on Lombard (the “crookedest street” in the world) before getting on 101 to San Jose. We had previously visited San Francisco as a family in 2006 (touring Alcatraz, the wharf, trolley lines), and planned to return later in the week. Wonderful memories and sounds like the next phase of life for our young grandchildren - looking forward to colleges! However, they are growing too fast and we look forward to their HS experiences, accomplishments and graduation. Slow down and enjoy the remaining 2 - 3 years of growth. Go bless and watch over you all. Love you.